PERFORMING A JOB YOU HATE « THE BRYCE IS RIGHT! – Things to consider before tackling that ugly job you despise. Years ago, my grandmother made the observation, “In everyone’s life, you must eat a teaspoon of dirt.” There is a lot of wisdom in this comment. Throughout our lives there are little jobs we are called upon to perform, be it at home, school, the office, or wherever, tasks we simply hate to perform. Whether you have been asked to do it or realize it is something you have to do of our own free will and accord, tasks you simply do not want to undertake. Maybe it’s a job requiring physical skills and talents you simply do not possess, or maybe it’s a “dirty job” involving unique situations that are not exactly the most sanitary, such as cleaning up after an animal. Or maybe it has to do with a boss you do not like or respect, someone with an unsavory character. Working for a boss you like is one thing, working for someone you despise is something else altogether. Bottom-line, it’s a job you dislike and are reluctant to perform. So what do you do? Quitting is the easiest alternative, if you can afford to do so, but it also means you have been defeated, which may be the reason you were asked to perform the task. Sometimes you are asked to perform no-win jobs simply because someone is looking for an opportunity to watch you fail and eliminate you. Sadistic managers are notorious of assigning such tasks. It’s a setup for which you are not expected to succeed. When I discover I have been put in such a position I usually rise to the occasion and conquer the task quickly, professionally, and with great zeal. There’s nothing quite like turning the tables on an adversary. It unnerves them. For all other difficult tasks, I have found it’s a matter of having the right tools and working conditions for performing the job, and putting yourself in the proper frame of mind. Just resign yourself to your fate and “Get ‘R Done.” This, of course, requires patience and determination, two elements which seem to be in short supply these days. Early in my career, we were developing a series of seminars to promote our software product line. 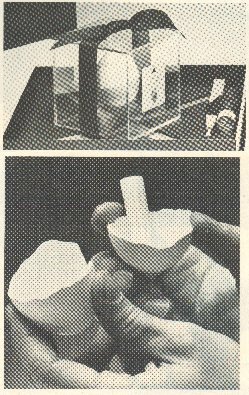 Working with an ad agency, we devised a clever invitation which included a beautiful brochure, and an egg housed in a photo cube (you remember, those little plastic boxes where you could insert photographs). Inside the egg was an invitation to the seminar with the person’s name on it. In other words, they were instructed to crack open the egg where they found their invitation and instructions. From a marketing perspective, it was brilliant and garnered a lot of attention. To implement it though was another story. As this was my pet project, I found myself selecting the seminar sites, compiling lists of potential attendees, and assembling the invitations. That’s right, I found myself burdened with blowing out hundreds of eggs, inserting the invitations, and resealing the eggs (using “White Out”). Assembling the boxes and brochures was easy, but preparing the eggs was another story. I simply resigned myself to the task, setup a radio and blew out hundreds of eggs and packed them up. I quickly discovered blowing eggs requires a certain knack. If you do it wrong, the egg blows up on you and creates a mess, but if you take your time and find your rhythm, you’ll do just fine. You just cannot push it too hard, and I found the job took me all night to perform. Even though our seminars were a success, I still loathe the thought of blowing out eggs. I’m sure there are other jobs that are worse, but you get the idea. NEXT UP: WRISTWATCHES – Are they still status symbols? LAST TIME: THE ART OF PATIENCE – An art that is difficult to master. This entry was posted on July 31, 2013 at 6:09 am	and is filed under Management. Tagged: Florida, palm harbor, PERFORMING A JOB YOU HATE, The Bryce is Right, tim bryce. You can follow any responses to this entry through the RSS 2.0 feed. You can leave a response, or trackback from your own site. Holy Crap ! You’re talking about me……………………………aren’t you ?? ?